If you are a contractor or even need some construction or repair work to be done at your home, a Senco Nail Gun will be really useful for you with its durability and high quality. Senco Tools has been providing solutions for home renovations and construction for over 50 years now and have been making tools that are used extensively both for private and commercial purposes. One of the great tools that they make is the Nail Gun. 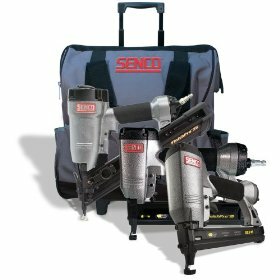 Both pneumatic and cordless types are available by Senco Tools. Has an ample operating pressure to ensure all sorts of tasks are effectively carried out. It doesn't matter what sort of construction work you need or the type of nail that you need to be put, Senco Tools are sure to have a nail gun to suit your purposes. Having both the pneumatic and cordless variety Senco products can be used with equal ease by the do-it-yourself types and by professionals. The pneumatic nail guns are powered by compressed air and hence make short work of any construction work like finish carpentry, roofing, fencing or nailing. All these are available in a heavy duty and mini version depending on the type of work. For those who are working on a budget it would be pertinent to use the cordless variety. This is great for lighter jobs and has the capability to drive 1000 nails with just one charge of a battery. With their comfortable grip and light weight feel, the cordless version is much recommended. Many customers have reported great wrist and arm comfort while using this particular variety. Maintenance is also not an issue with the Senco nailer and it is modelled to withstand wear and tear. However for those of you who are looking for a nail gun which has the features of the pneumatic and the cordless variety then the Cordless gas nail gun is the perfect choice. With a combination of the power of the pneumatic variety and the grip and comfort of the cordless one, this nail gun is a boon for any construction job. So it does not matter what sort of work you need to get done, there is sure to be a Senco product that can do the job for you. Some customers have reviewed that the Senco nailers can sometimes get jammed and it can be sometimes difficult to unjam it. Their instruction manual is quite basic and can sometimes be lacking in detailed information. There have also been instances where the depth adjustment sometimes does not work consistently. Over and all Senco nail gun remains a great option for all sorts of construction tasks and should be a useful addition for any workshop, whether home based or commercial. Designed in an ergonomic fashion it will be a pleasure to use for your construction needs. All the years of experience that Senco has is put behind their tool in all respects. Return From Senco Nail Guns Page to Home - Finishcarpentryhelp.com.